I have discussed newspaper coverage of the lager-centric New York beer scene in various periods including 1891 and 1877. As the decades wore on you can sense the industry becoming bigger and more sophisticated. The same applied to the bar and beverage business (retail). Let’s go back a bit, to October, 1854. The New York Daily Tribune wrote up the subject of lager beer in New York. It has an introduction with broader aims, taking in the history of beer and beer-like beverages in Europe and elsewhere, but the heart of the article is on the Manhattan beer scene. The article stresses that lager beer was “the” malt liquor by this time and had practically effaced the older ale and common beer. 2000 saloons and drinking places offered beer in town, the bulk lager beer. Over 3,000,000 gallons per year were consumed annually. Many other facts and figures are given in the article, which you can read here, including the fact that about 1.5 lbs hops per barrel were used in brewing. This figure tallies broadly with other sources and held to the end of the century. The article discusses, if only to dismiss, a bunch of northern and eastern German beers, many with odd-sounding names. How does Murder and Manslaughter sound for size? Or cow’s tail? Then there is Israel, which beeretseq.com is very glad to read about (and has before), but why would a German beer be called Israel? It was a Lubeck speciality. All these provincial beers outside Bavaria are said to have yielded to the all-conquering lager, which finally hit American shores. The Schaefers in New York, who established a brewery in 1842, were noted early lager-brewers but some accounts state they made ale until 1848. Britain is one of the great brewing nations of the world. New York was, sociologically, an English town after it was a Dutch one and before it was truly American. How could lager displace the far-famed English ale and porter? The article suggests these beers were too strong and caused fights and commotion while the German saloons were generally peaceful. It called “ruffians” those who haunted porter-houses. One can infer as well from other sources that the ale and stout were often sour. Lager was not. In 1854, lager still held to the European winter beer-summer beer divide. More was drunk in winter than summer and the summer beer, by being long-stored, was more expensive. Use of ice and mechanical cooling later effaced this distinction. But whether old-style or new, brown or finally pale, lager captured the American imagination almost from day one. One of the absorbing parts of the article is the observations on saloons and the typical pub-goer as well as pub landlord. Most were Germans recently arrived and most of the lager made was consumed by Germans. Still, the trade had grown so large the “Trib” took notice. In another 20 years, lager became an American drink, drunk by all comers. Its German associations, while not quite forgotten up to the 1930s, receded into insignificance. But the Trib was talking about a time the drink still had strong ethnic associations. Acknowledging that a few low-down German places were disorderly or of ill-repute not to mention their sour beer and cheap tobacco, the article said most lager saloons were respectable places. They offered a cool cellar or vault, a repose from the heat or tumult outside. The article noted differences in German and American drinking habits. The Germans sat at their beer and took their time. The Americans took their drink at the bar and left like an “ignited rocket”, not taking time to appreciate the taste. Again in time these differences evened out. The article points out that many saloon-keepers were formerly men of high standing in middle Europe who had to leave because of the “Revolution”, to escape an “Imperial bullet” or “dungeon”. That’s the 1848 Revolution, if you remember from high school, Kossuth and all that. Lawyers trained in “Roman and German law” found it was not “available” (useable) in New York and most such refugees spoke no English anyway. The same for ex-military men, professors, and other grandees of the old country who bet on the wrong side in 1848. Many turned to tending bar or hotels in New York, it was the “omnipotence of want“, as the article put it. And for this, they needed a strong stomach, both to endure mouthy loungers who had a “sixpence” but also to drink with the customers. If you couldn’t take the liquor, you had to have a partner who could. And so, in these trans-atlantic salons, melancholy half-way houses of those “entre deux chaises“, former kahunas of Europe swept the floor and poured ze lager. We had Hungarian restaurants in Montreal like this in the 1950s. The late George Jonas, the Hungarian-born Toronto journalist and author, would have appreciated this earlier recounting of an age-old tale. Although to be fair, success found the uber-talented Jonas not long after his arrival to our shores. He is much missed. And so, picture yourself a Yankee or Knickerbocker (old Dutch stock), wandering into a peaceable haunt with a German name in 1850s New York. Newspapers in foreign tongues strewn on the tables. The strange odours of sausage and sauerkraut steaming from the scullery. Clouds of pipe-smoke and cigar-effusions making everyone look kind of the same, American. Order your krug of lager, which was probably Munich-style brown beer then. Listen to the piano player, have another krug. I tell you Willy, this is better than Peterson’s damnable porter-house. That sour stuff he sells is full of “brewer’s drugs” some say, cream of tatar or something. There is always a brawl there sooner or later, and next day I awake with a sore head even if just from the beer. Here, with two or three lagers you feel good and then you’re full and can’t drink any more, time to go home for dinner and you can taste it. Next time I’ll bring John or Patrick from the counting-house, they would like it, too. That ladder seems higher every day at the bank, you know. What kind of turn-over is Herr Mueller doing here, Willy? That much you say? I should escape Wall Street and establish a lager brewery. Willy, didn’t you tell me you worked at a brewery in Munich…? 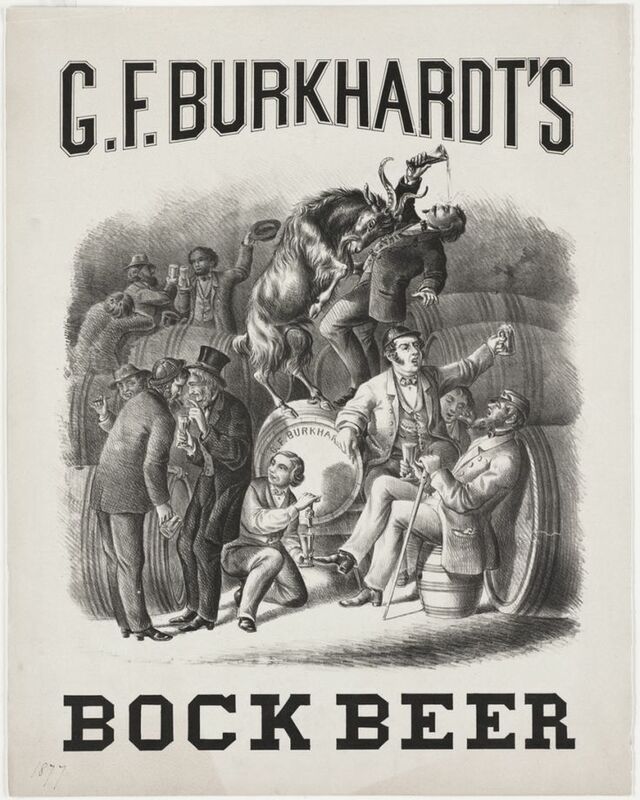 This way of drinking beer became the American norm for the next 150 years. Our Yankee and finally all New York’s multitudes liked the German beer and atmosphere, in time the foreign quality lessened but the lager was as good as ever – until they started putting lots of corn or rice in it, anyway. *The true consumption and production numbers appear as reflected in the current version this post, i.e., 3,075,000 gallons consumed in Manhattan with 27 breweries producing 85,000 barrels @ 30 gal. each. The difference was made up by imports from Philadelphia and elsewhere. The article is a little inconsistent with the numbers, probably intentionally to emphasize the huge growth in lager in under 10 years. Note Re Image: The image above was sourced from Pinterest, here, and is believed available for historical and educational purposes. All trademarks or other intellectual property shown belong to their owner or duly authorized users. All feedback welcomed. Interesting, Gary! I have read quite a few stories about how whole families went to German saloons and beer gardens in NY and how civilized they were. I think it inspired some reformers who believed that drinking places could become neighborhood centers rather than depots for drunken men. Thanks Jan, and what you said is definitely the general tenor based on my researches. I have another reference I’ll try to find of an early large-scale German picnic on Staten Island, and the writers, who in this period reflect the Yankee/old Dutch perspective, always express surprise at the generally peaceable nature of it. Since whiskey, rum, and apple or peach brandy were the main American drinks before 1850 (hard cider too, but it was more rural), that probably encouraged excess. Also, the ale and porter mentioned in the Trib’s account would have been almost twice as strong as the typical lager then. Even if it was half as strong again, it makes a difference over time. McSorley’s Ale House in New York in East 7th is a surviving example of the older, pre-lager tavern even though established IIRC after the Civil War. McSorley’s to this day still serves beer that isn’t really the typical lager taste although closer to a lager profile than it would have been in the 1800s. To some degree, I think the T-Total people exaggerated the sins of the porter- and ale-houses and minimized perhaps those of the lager saloon and biergartens, but that a difference existed, in part because on Sunday the Germans allowed families to participate, cannot be denied IMO.